If you have any trouble at all with your ordering process, please do not hesitate to call Raphaella at 941.993.7001. We want your Heartful Art ordering experience to be easy, effortless and enjoyable. Quotes - 5" x 5"
Quotes - 5" x 7"
Quotes - 8" x 8"
Quotes - 8" x 10"
Quotes - 11" x 14"
Prints - Bugs, Butterflies, Fish, etc. Prints - Cats, Dogs, Teddybears, etc. 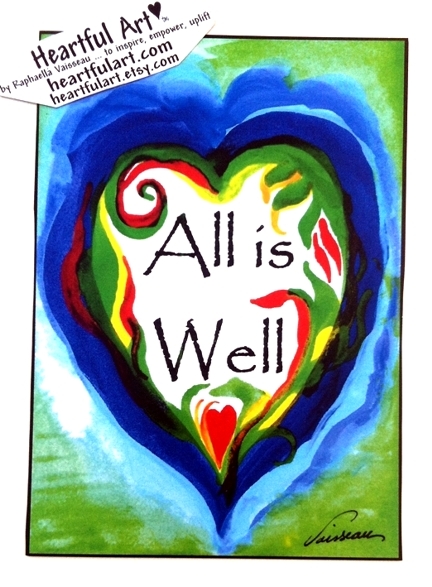 ALL IS WELL is a 5x7 colorful poster by Raphaella Vaisseau to remind us to relax, trust, have faith, breathe in and out, let go and let God. NOTE: Heartful Art copyright labels that may appear in product photographs are not on the product itself but simply appear on the online image, similar to a watermark. Love yourself. Enjoy life. Be happy.